I’m not an attorney. Regardless, this is one impressive pleading and I don’t see any way out of this for Range Resources. I am begging you to read this pleading. If I remember correctly, fraud means the plaintiffs get treble damages. Is that right? I’m pretty sure it is. I can’t wait to see what Pitz comes up with for this one. 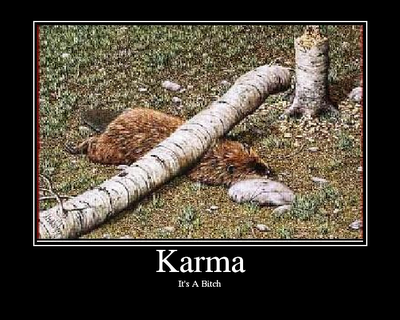 Published: Friday, May 25, 2012, 9:41 p.m.
Is this Karma at work again? If I remember correctly, Range Resources is trying to include me in their fantasy about a conspiracy to defame their fine reputation as an excellent driller. And in their effort they carefully string together a series of incidents–like a photo of me with a government official and an email–to craft a series of conclusions that amount to nothing. Whoops! After reading the pleading, I’m certain that Pitzarella’s statement is not true in this case but it is certainly true in the reverse when you consider the totally manufactured motion to compel in the subpoena Range sent to me. But this is not about me. This is just more proof that Range Resources does not have the good reputation they claim. Range, which has attempted to foster a friendly, folksy, corporate image in commercials and ads featuring regular rural residents and leaseholders, has maintained for years that its Yeager operations, which include one “fracked” well and two drilled wells, condensate tanks, the flowback fluids impoundment and drill cuttings pit, have not contaminated groundwater. But full and complete test results subpoenaed from Range but never revealed to residents near the Yeager well site show that chemical contaminants similar to those found in the fracking flowback impoundment and the drill cuttings pit were also found in water samples from wells and springs. Range showed or sent to the plaintiffs and the DEP less detailed test reports that showed many chemical contaminants were “not detected” in the water samples, but, the lawsuit says, omitted results for others, including several semi-volatile organic compounds that were present in the groundwater samples and the company’s impoundment and pit, and that showed the water was contaminated. Because they relied on the test reports, the plaintiffs — Stacey, Harley and Paige Haney; Beth, John and Ashley Voyles; and Loren and Grace Kiskadden — continued to drink, cook and bathe in the contaminated water. READ THE PLEADING. IT’S AMAZING. Monday morning you can watch NYSE:RRC stock fall further HERE. UPDATE: Stunning aerial photos of the Range impoundment HERE. Days like this I bet CHK and Cabot are happy to have Range Resources around, give them a chance to come up for some air. So to speak..Range Resources will do what it always does-spin, spin, spin, settle. Keep an eye on this case and it will end like the Hallowich’s and Gulla’s. One day it’s there, next day it’s not, and nobody’s talking. Unless you’re Ron Gulla, of course, who got hit pretty hard by Range, but hits back himself pretty hard, too. Thanks Sharon, for posting this. Some of the defendants named in this action clearly belong in jail. I hope they sleep well tonight. I also hope those families with children involved will be able to relocate at least until they can get that mess cleaned up. Kids need to be able to go outside and play, and not have to worry about being poisoned by their neighbors. The plaintiffs attorneys understandably focus on high levels of hydrogen sulfide repeatedly detected in the headspace above the impoundment by one of Range’s contractors. No mention is made of concurrent exposures to carbon disulfide or carbonyl sulfide in this lawsuit. I hope all of you out there are paying attention to this part. This woman is not complaining about a rotten egg smell. I hope none of you ever have to smell what she smelled on that morning; or ever have to put up with some regulator or politician – with no data whatsoever – try to tell you what you are and aren’t being exposed to in your own home. Please remember, in H2O; CS2 and COS will react to form H2S. All three of these gases will be expected to rapidly “volatolize” from that water and flow downhill immediately. H2S is the lightest and least persistent of these three gases. Yes, it can get tiresome; all of it. This story is being carried in other states, as well. David W. Schrack vs. Range Resources- Appalachia, formerly f/k/a Great Lakes Energy Partners, LLC, a Delaware limited liability company, et al. * Defendant’s concealment; failure to disclose resulted in many landowners entering into oil and gas leases in which they received far less than the fair market value and a delay in rental payments. It is further claimed that defendants unjustly notarized signatures when they had a qualifying interest in said documents. Plaintiff seeks a declaration of duties and obligations of the parties under the multiple documents and the Lease, dated Jan. 17, 2009, be declared null and void. A trial by jury is demanded. Gee, Sharon, it sounds like RRC is creating their own issues that “defame” them. Wow! If you scroll down there are even more.